After leaving school, I went straight into the paving industry working and training on sites around London and Surrey for a large paving company. In 1990, I started my own business Design Driveways and Landscaping. I have built up the business and can work on large domestic contracts due to my experience, my team and having the use of our own plant, machinery and tipper trucks. 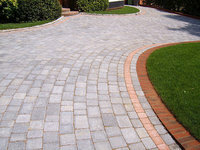 We have six full-time staff, all with many years experience in bricklaying, paving and landscaping. We have also been working with an electrician and steel fabricator for many years, so we can offer the full garden and driveway package. So why not contact me Mick Wyard for a free no obligation quote, or to discuss your design ideas or project. Team of hard-working guys with good attention to detail and pride in their work. Always prompt, reliable, friendly and helpful. Would highly recommend. Excellent job, delivered on time, fair pricing and excellent workmanship. Highly recommended and will definitely use again. Very pleased with garden transformation. Mick and his team understood what we required, finished on time and to budget. Would highly recommend him, and used him previously for a new driveway. We are still get compliments from the neighbours! Good job completed - more than happy. Punctual, hardworking and job completed as per estimate. Design Driveways have converted our terrible front garden into an amazing terraced space with parking for two cars. The team could not have been more knowledgeable, helpful and tidy and we would recommend them to everyone. An excellent job laying a driveway. Prompt, professional and kept to time and cost. Highly recommend. Very, very professional throughout. Their work is of the absolute best. All their workforce were very knowledgeable and polite. Would highly recommend this firm. Punctual, hard working and courteous. Drive & patio demolished and replaced within the 10 day quote. Left clean & tidy. Would recommend without reservation. Final price as quotation. Good attention to detail and finish. Efficient work force, police and completed and left very tidy.